There are different types of computer attacks that websites or servers suffer all the time. One very simple but that bears its fruits is the so-called brute force attack. Here we will show you how they steal a key by trying all possible combinations until they find the one that allows access. The intention is to show you how these work and how dangerous it is to have bad passwords. If you are still lazy (we all are) to change the passwords for some more secure, after reading this article you will not hesitate to go and do it now. Brute force attack is the method to find a password by trying all possible combinations until you find the correct one. 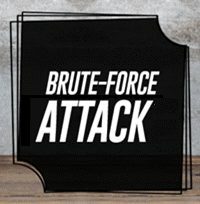 Brute force attacks are one of the most common techniques for stealing passwords on the Internet, since it is not necessary to have a great knowledge of computer security to carry out one and there are programs that automatically perform all the work. Due to the popularity of these attacks, we can find in many web sites the so-called captchas that try to detect if the person trying to access the service is human or it is a computer software trying to burst a password. How does it work a brute force Hacking? The attacks by brute force, since they use the method of try and failure, are very expensive in computational time. Brute force is often combined with a dictionary attack. A dictionary attack is a hacking method that consists of trying to find a password by trying all the words in the dictionary. This type of attack is usually more efficient than a brute force attack, since many users usually use an existing word in their language as a password to make the key easy to remember, which is not a recommended practice. Dictionary attacks are unlikely to succeed with systems that employ strong passwords with uppercase and lowercase letters mixed with numbers (alphanumeric) and with any other type of symbols. However, for most users remember such complex passwords is complicated. What kind of web pages are vulnerable to a Brute Force Hacking? This Brute Force attack can be applied to social network accounts, emails, online banking services, mobile devices, FTP or SSH services, and a long list of services, devices, and situations that are vulnerable to this type of hacking. Cyber criminals use it as a first resource, and it is something that still works. The reason is none other than the simplicity of the passwords that users use to protect accounts or services. Hence, security experts always recommend using passwords based on data that may be trivial for cybercriminals.